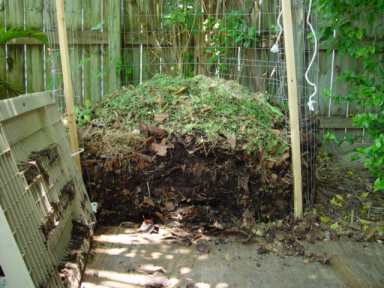 The back yard compost pile, open it up and get ready to turn some black gold. Notice the piece of old plywood strategically positioned in front of the pile. This helps in cleaning up the area after the turn.. 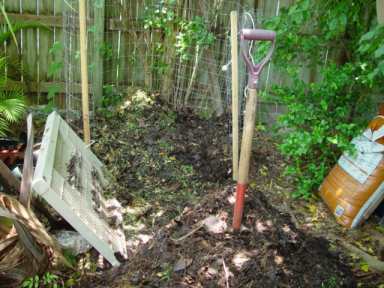 Fork out the compost, here you see a mix of green yard cuttings, dry leaves, coffee grounds and kitchen stuff. 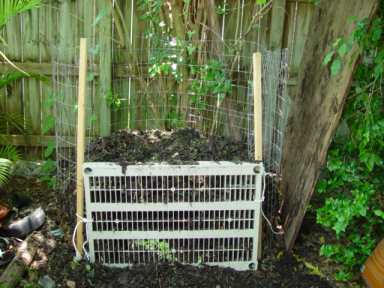 We turn the compost pile once every week or so to aerate and mix up the magical components. Put the gate back in front and fill the pile back up. It takes some work but this is where the cut between gardeners and wantabees is made. 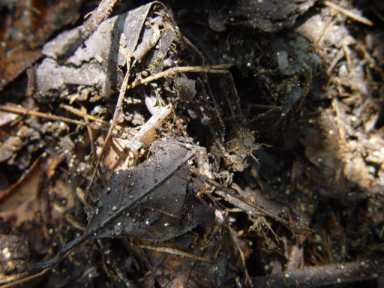 The compost pile is where everything gets recycled, renewed and fitted into a sustainable cycle.